This month's Dragon magazine / D&D Insider includes my latest entry in the History Check series, History Check: The Blood War. The in-game history of the Blood War is long, varied and complicated...and even more so across the editions and major campaign worlds of D&D. I had a good time wrangling them into a History Check tale, with some additional guidance from Wizards. Fans of Planescape should recognize a few things, but the article also touches on a lot of points from various sources. The article art is also the cover. I had a great year at GenCon this past week. Friday, especially, was a good day. In the afternoon, the new Star Wars RPG Edge of the Empire was announced. I'm one of the writer/developers. See my Star Wars Wednesday post for the rundown on it and how it upped the excitement level for the entire show. On top of that, the ENnie Awards were that evening. My D&D product Monster Vault: Threats to the Nentir Vale took a silver ENnie in the Best Monster/Adversary category. It was my first ENnie win, and a blast to be able to walk up on stage with my fellow writers (Brian James and Steve Townshend - Matt James was elsewhere) and lead developer Jeremy Crawford to accept the award. I told my wife, when else do I ever get to make an entrance to the tune Back in Black (which was WotC's selected acceptance music)? ENnie Award voting is now open. Go vote for Monster Vault: Threats to the Nentir Vale for Best Monster/Adversary. Thanks from my fellow authors and I. Here are a couple of my earlier blog posts, from when it was released. Monster Vault: Threats to the Nentir Vale nominated for ENnie Award! 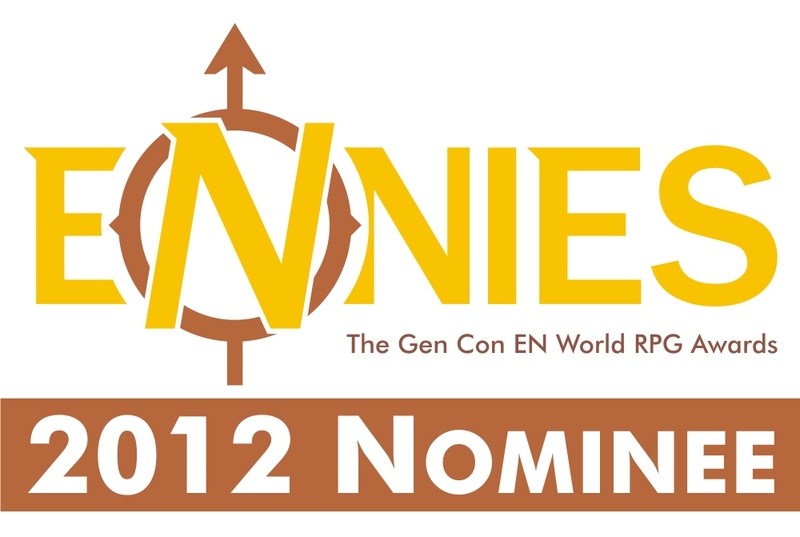 Monster Vault: Threats to the Nentir Vale for Dungeons & Dragons has been nominated for an ENnie Award for Best Monster/Adversary! My fellow authors Brian R. James, Matt James and Steve Townshend and I would love your support. Voting starts July 20, and the awards are announced at the ENnie Awards Ceremony at GenCon in August. This is my first ENnie Award nomination for a D&D product. "Deep in the Astral Sea, a mysterious force has been raiding, plundering, and destroying isolated settlements and astral ships. The heroes must brave the bizarre and dangerous environment to follow this trail of destruction and hunt down whatever force is behind it." My first article on the Dragon side of D&D Insider went live today. History Check: Rary the Traitor. Must be a subscriber to read. August 10, 2011 in Star Wars Wed. It's been a busy week and a half, or so, between GenCon, preparing for GenCon, work, home and car disasters and work travel. On the plus side, GenCon went well and I think it will be an interesting year, both personally and in the gaming industry. We'll see how things go. Monster Vault: Threats to the Nentir Vale is now available in a lot of places, a bit ahead of schedule. You'll find all kinds of great monsters and organizations ready to throw into your Nentir Vale campaign, or any locale of your own devising. My co-authors are Brian James, Matt James and Steven Townshend. Along with many of the monsters, I designed the swamp map contained inside (though I didn't do the art). The black dragon and the lizardfolk on the cover are also mine, story and stat-wise. They would be Shadowmire and his Witchlight lizardfolk underlings. If you're a D&D Insider subscriber, check out my tie-in adventure, Battle of the Witchlight Hermitage, just released TODAY, to see these guys in action. It uses the the swamp map as well. Shadowmire, the black wyrm of the Witchlight Fens, doesn’t like his neighbors. Can you protect a poorly defended hermitage from the dragon’s wrath? A D&D adventure for characters of levels 3–5, designed to support Monster Vault: Threats to the Nentir Vale. I see from my site stats that a few eager GenCon 2011 attendees/players found my old post on CHAOS D&D, some through a google search. Thanks for the interest! I've gone back and edited the plot info out of the entry, but reading it may still give a way some spoilers on how the game itself is played. Though that in and of itself is not a secret (CHAOS has been running for years at ShaunCon and KC Game Fair), it's still more fun for some people to experience it first hand. As to the plot info earlier readers or players may have read/played, CHAOS plots have a way of developing over time (and even in game), so I'm sure it won't be exactly the same this time around. For those who aren't following all of that, the Roleplayers Guild of Kansas City, Ltd. is running two rounds of its long running Chaotically Hysterical Association of Systems (CHAOS) event at GenCon 2011. My adventure Chaos Scar: Scarblade is now live in Dungeon Magazine for D&D Insider subscribers. It's my first Dungeon and DDI contribution. Come to think of it, it's my first 4e to be released (though not my first 4e first project). Somewhere in the Chaos Scar is the Proving Pit, a gladiatorial arena that is associated with an enticing magical sword called the Scarblade. Ruling over the Proving Pit is Morrn Bladeclaw, its foremost champion and former owner of the Scarblade. To claim the mystical blade, challengers must face Morrn Bladeclaw, but not until they've bested the pit's lesser champions first. But the Scarblade, and the Proving Pit itself, might have something to say about the situation. "Scarblade" is an adventure for characters of levels 7 to 9. Wizards posted a preview of the upcoming Monster Vault: Threats to the Nentier Vale based on last month's Rule of Three poll. You can see the preview (along with others) here, and download the stats for the Wandering Tower, winner of the poll (but not one of my contributions). This product is due to be released in June 2011. Includes monsters stats and organizations they are part of. There are at least two websites liveblogging the DDXP seminars, the host Baldman Games and Critical Hits. It is interesting in that they are both using google docs, but different approaches. For the Products Seminar, baldman's version has a lot of detail, but updates in chunks of information at a time. Critical Hits' version is showing up live as it is being typed. You get more of a feel for the flavor of the event/audience, but less specific info. Any fan of the game ought to read both. It's the most up to date info available right now. Also, check out the seminar live blogging over the rest of the weekend. 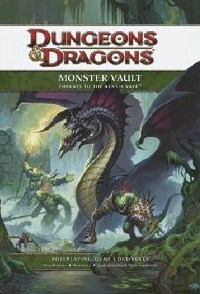 Just found out that Monster Vault: Threats to the Nentir Vale, my first Dungeons and Dragons 4e print product, is up on Amazon and will be out in June 2010. Not much I can say yet, other than it's a box set with maps and tokens. My fellow authors are Brian R. James, Matt James, and Steve Townshend. The Return of the D&D Red BoxGenCon 2010 flew by quickly. I had a good time (aside from my wife falling an injuring herself). Our Star Wars Saga Edition Retrospective was full, with about 50 attendees. It was entertaining. We had a lot of good questions, though not really any rules questions, which was somewhat surprising. The panel was also large, with myself, Owen KC Stephens, Gary Sarli, Christopher West, Gary Astleford, Patrick Stutzman, and T Rob Brown. Rodney Thompson and Chris Perkins were interested, but other commitments prevented them from coming (or arriving in time). Among the new items announced at the Dungeons and Dragons Preview seminar was my first D&D 4e print product, Monster Vault: Threats to the Nentir Vale. Can't say much yet other than it's a box set with a book, tokens and poster maps. Also met my fellow authors in person for the first time (Matt James, Brian James and Steven Townshend). Click here for a picture of the cover. The Rebellion Era Campaign Guide did not win an ENnie for Best Supplement, but the awards show was entertaining. Congratulations to the winners. I found some time to run a Star Wars Saga Edition game for a few friends and introduce it to them. They ended up hunting down the books in the dealer's hall before the show was over. I've had this sort of reaction most of the time when I run a Saga Editon game at a con, which is a lot of fun. For those who have asked if the Saga Edition books are more or less expensive now that the line is over, I will have to say....both. Depends on the book. I've seen Force Unleashed for as cheap as $10, others at cover price or up to $20 more. Kotor and Starships of the Galaxy remain impossible to find. I saw really good prices on the minis and maps, though. I played in Savage Saturday Night, Pinnacle Entertainment Group's Savage Worlds RPG open gaming night. Ended up in a Ravaged Earth setting game (by Savage Worlds licensee Reality Blurs) with its creator, Eric Avedissian. They had well over 100 people, and twice what they expected to show. I think most everyone got into a game, however. It was interesting to see huge variety of settings now available for one system being played in a single room. As usual, I also attended several seminars and meetings, among which was one on the new Gamma World RPG from Wizards. As an old-time Gamma World fan, I'm looking forward to this one. It's humoursly presented and though it's 4e compatible, it has a lot of its own unique design elements. I also pursued new freelancing opportunities in writing and cartography, caught up with old friends and met a few new ones along the way.